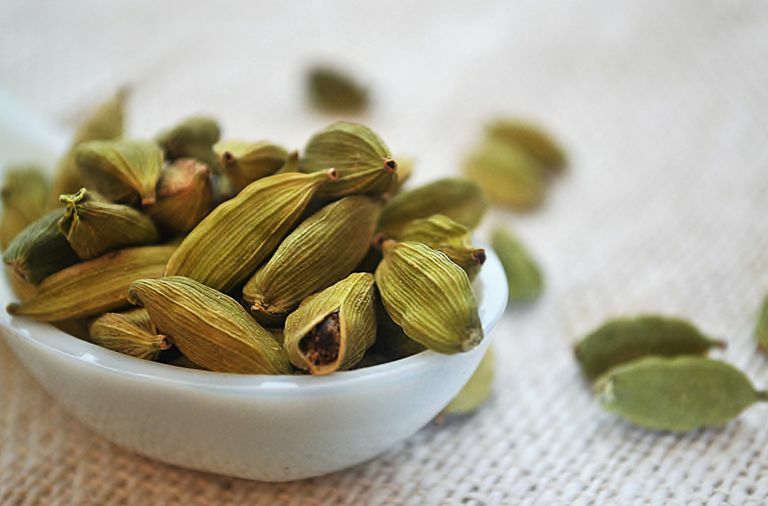 Cardamom is a spice that is commonly used in Indian cooking, Middle Eastern dishes, drinks, and baked goods. Green cardamom (Elettaria) and black cardamom (Amomum) come from the pods of a plant (Zingiberaceae) in the ginger family. The spice has a warm, smoky, sweet flavor that some also describe as minty. You'll see cardamom sold in many different forms. It is sold in ground form and known to be one of the most expensive spices. You may also find cardamom pods, cardamom extract, and cardamom oil that is made from the seeds. Cardamom may also be used to increase appetite or to boost water loss. There are even some reports of people using cardamom to induce an abortion. However, there is a lack of scientific evidence to support the use of the spice for any of these indications. There is some limited research that suggests green cardamom may help to reduce blood pressure in patients who are newly diagnosed with hypertension. However, more studies are needed to confirm this benefit. There is also preliminary research suggesting that a mixture of essential oils from cardamom, ginger, and tarragon applied to the neck after surgery can prevent post-operative nausea. But more evidence is needed before scientists know for sure if this treatment is effective. One teaspoon of ground cardamom (2 grams) provides approximately 6 calories, just over 1 gram of carbohydrate, and less than 1 gram each of protein and fat. Cardamom will help you meet your daily manganese requirements (0.6 mg per teaspoon or 28 percent of your daily value). The spice will boost your calcium intake slightly (7.7 mg) and also contribute to your potassium intake (22.4 mg). There is also a small amount of magnesium (4.6 mg) and phosphorus (3.6 mg) in a teaspoon of the spice. Lastly, you'll get a small dose of vitamin C with cardamom. A teaspoon provides 0.4 mg, or 1 percent of your daily recommended intake. Because cardamom is expensive and doesn't have a long shelf life, some savvy cooks choose to buy the pods rather than the ground spice. Pods last longer when properly stored. If you purchase ground cardamom, it should be kept in an airtight container and stored in a cool dry place, such as your pantry. The ground spice is likely to stay fresh for several months. If you purchase cardamom pods, you should also store them in an airtight container in a cool and dry place, but they are likely to stay good for about a year. Cardamom is likely safe if you use it in typical amounts required for cooking. And it may be safe when used as a medicinal aid, but little is known about the potential side effects of cardamom. Health experts advise that cardamom may be unsafe when used in medicinal amounts by pregnant women. If you are expecting, check with your healthcare provider to get personalized advice. Additionally, patients with gallstones should avoid cardamom in amounts higher than those typically found in food as the ingredient may trigger gallstone colic. What is the best cardamom substitute? Even though the flavor of cardamom is fairly unique, there are several spices that you may be able to use if you are out of it. These include nutmeg, cinnamon, ginger, allspice, apple pie spice (which may include cardamom anyway), or cloves. How do I grind cardamom pods? If you buy cardamom pods, rather than the ground spice, you'll want to toast the pods before grinding them. Then simply use a mortar and pestle to smash pods and reveal the seeds. The seeds can then be ground again using the mortar and pestle again or by grinding them in a coffee or spice grinder. Natural Medicines Database. Cardamom. Professional Monograph and Patient Handout. Published Dec. 2017. Jamal, A., Javed, K., Aslam, M., & Jafri, M. A. (2006). Gastroprotective effect of cardamom, Elettaria cardamomum Maton. fruits in rats. Journal of Ethnopharmacology, 103(2), 149–153. DOI: 10.1016/j.jep.2005.07.016. Gilani, A. H., Jabeen, Q., Khan, A., & Shah, A. J. (2008). Gut modulatory, blood pressure lowering, diuretic and sedative activities of cardamom. Journal of Ethnopharmacology, 115(3), 463–472. DOI: 10.1016/j.jep.2007.10.015. Verma SK, Jain V, Katewa SS. Blood pressure lowering, fibrinolysis enhancing and antioxidant activities of cardamom (Elettaria cardamomum). Indian J Biochem Biophys. 2009;46(6):503-6. Hunt R, Dienemann J, Norton HJ, et al. Aromatherapy as treatment for postoperative nausea: a randomized trial. Anesth Analg. 2013;117(3):597-604. DOI: 10.1213/ANE.0b013e31824a0b1c.